My name is Kendal Kane and I'm a professional magician and party DJ specializing in helping businesses create unforgettable Christmas parties by exceeding expectations GUARANTEED! For over 25 years my unique programs of magic, mind-reading, and comedy have made Christmas parties for businesses amazing, fun, and memorable. Making your company’s holiday party memorable is a difficult task. You want it to be fun and extra special – all while staying within a budget. What Really Makes A Company Christmas Party Unforgettable? My name is Kendal Kane and I am a professional magician who specializes in helping make corporate events memorable and fun. My clients include Biotech, 1st Clinic, On Trac Promotions, U.S. Figure Skating Championships, and many more. So why should you have me entertain at your Christmas party? 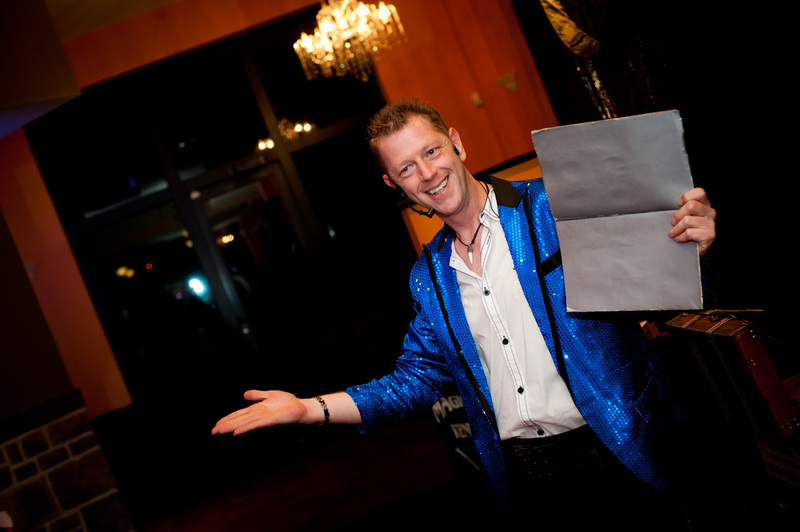 Seven Times More Fun Than With Any Other Corporate Entertainer! Sure, there are a lot of good entertainers out there BUT none of them even come close to offering such total entertainment packages. Check it out for yourself! 1. Comedy. You’ll be thrilled as your guests laugh and see all the smiles during my very funny programs. 2. More Audience Participation Than You Can Shake A Stick At. Do you have some important people you want to make sure I include in the show? CEO? Board Member? No problem. Just let me know who they are and I’ll make sure that they get involved. Everyone is treated with respect but we do have a good time with them! “I wish I had been looking over your shoulder the whole evening, to see the delight and amazement on everyone’s face!” Bill Stevens, Biotech. 3. Unbelievable Magic & Mindreading. Even after you see this you won’t believe it. You will be left scratching your head and wondering if E.S.P. actually exists. “It has been such a joy to work with someone as talented as Kendal Kane. We heard so many complimentary comments about you. You were everything I expected you to be – and even more! Sandy Moore, H.R., 1st Clinic. 4. Music & Theater. My show has a unique blend of magic, theater, and music to create an enchanted evening of mystery appropriate for all ages. “Everyone loved your combination of music. Your magic went right along with the music which was the highlight of our party!” Randy Smile, GM, Walmart. 5. Free Magic Booklets. 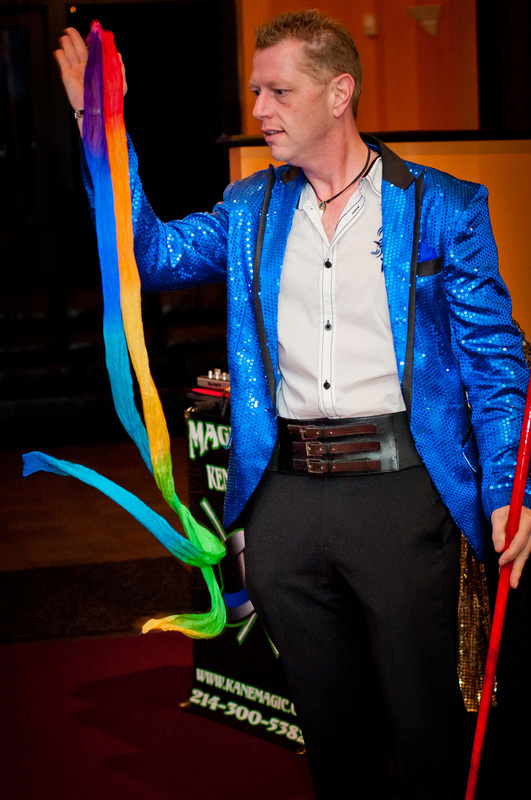 All my entertainment packages include up to 100 FREE magic booklets for you to give to your guests. These cost the company nothing and everyone gets to take home something unique to remember the event by. 6. DJ Action. Music at your event really enhances the overall experience for your guests. With a customized play list created for you, having a DJ will ensure all will have fun and enjoy hearing their favorite songs. You’ll be delighted to hear a variety of holiday music that is sure to appeal to everyone. 7. Total Party Coverage. Unlike any other party entertainer, my focus of attention is giving your party top priority you desire. The best part of all is that no matter how long your party is, I will be there for the entire party because of the DJ part of the package so there is TOTAL PARTY COVERAGE. It’s during this cocktail hour that the magic happens one-on-one, right under your guest’s noses and even right in their hands, setting the stage for an entire evening of fun and amazement. If you’ve ever seen David Blaine or Cris Angel’s magic on TV, you already know how powerful an experience this type of “close-up” magic can be! This 45-minute to one hour magic show has a unique blend of magic with pure sleight of hand, funny mind reading, mystery, and music to create a magical evening of mystery. It's dramatic theater unlike anyone has seen before! Filled with audience interaction, ensures everyone will have a GREAT time. An action-packed non-stop roller coaster ride full of entertainment is presented to an enchanting blend of magic, music and mystery which enhances the atmosphere and captivates the audience. 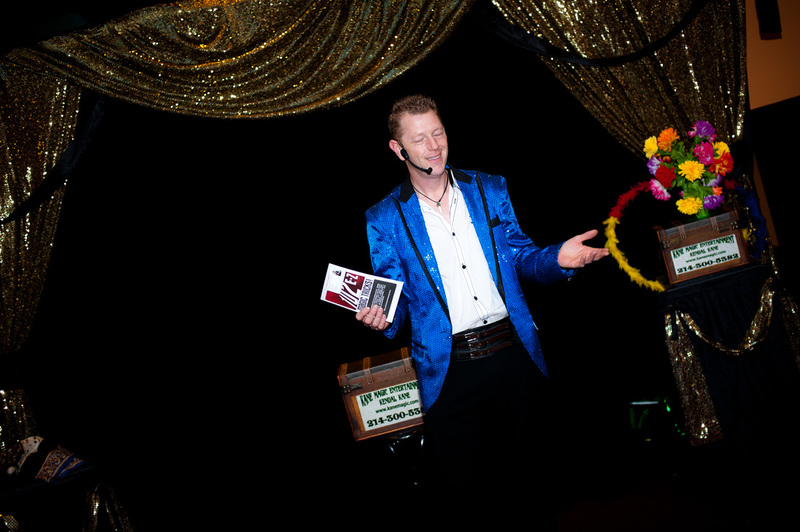 Kendal Kane is the only magician that combines music in his whole act and helps set the theme for an incredible show just like you would see on TV, Broadway, Las Vegas, or even on a cruise ship! BONUS: DJ Action That Sets The Mood And Atmosphere For Your Event! Music at your event really enhances the overall experience for your guests. With a customized play list created for you, having a DJ will ensure all will have fun and enjoy hearing their favorite songs. The best part of all is that no matter how long your party is, I will be there for the entire party so there is TOTAL PARTY COVERAGE You’ll be delighted to hear a variety of holiday music that is sure to appeal to everyone. This deluxe combination package includes the walk around magic and the complete 45-minute after dinner show. It is an ideal partnership that will make your holiday party event, extra special. ​By booking my program for your company’s Christmas party, I’ll also include up to 100 FREE magic booklets for you to give to your guests. These cost the company nothing and everyone gets to take home something unique to remember the event by. Discover how easy it is to create an event that will offer wonderful memories that'll last a lifetime and make you look like a STAR! Just contact me today and I'll respond immediately with complete, no-obligation details. Just let me know what type of event you're interested in and I promise to get back to you almost immediately! Just email me at info@kanemagic.com or simply give me a call at 214-300-5382. It's that easy!